What if you just want something simple for your event’s entertainment. Onstage Entertainment’s DJ / MC service could be just what you need! It might be music – either in the background or as the feature – for dancing, or just for listening and remembering during social time. Or it might be music with some quick, fun games interspersed. Or it might just be having a microphone — and likely, having an MC to help make announcements, keep the event moving on-track, and such. Just like every group is unique, we believe every event is one-of-a-kind. So we work with you to plan the event, in as much detail as you’d like. Do you want total control over all the music? Do you just want to share some guidelines regarding genres? Some groups will dance, because it’s what they do. Others will not, just because they don’t. So maybe you’ll want to add some games … many of the titles on the “LINK TO List of Games” page can be adapted to work with the DJ service, plus we have others that fit well. 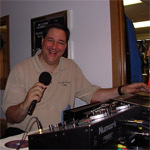 The DJ / MC option works well for many different types of event. Corporate celebrations and recognition, receptions, family gatherings like anniversaries and birthdays and reunions, graduations, and the list goes on. Sure we do weddings (click HERE (Link to RSVP/Wed) for more info) … but if your event is NOT a wedding, why would you want a DJ doing a wedding show? Get the show that makes sense for YOUR event! We bring professional sound equipment, song versions that are appropriate for mixed company, and an ear for the volume level that is “loud enough to dance, quiet enough to talk”.